Tripp is a beautiful boy that we have been long waiting for! Tripp is a sweet natured silly boy that we have been watching since he was born. 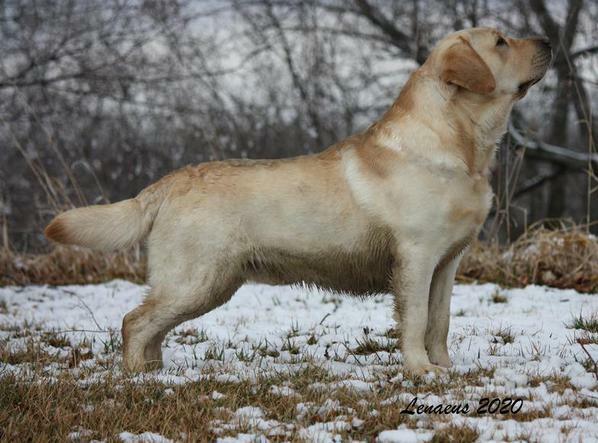 His pedigree is 6th generation Blue Heaven and has a lovely combination of some very influential Labradors and it shows in his outline. He is very balanced from head to tail, with a solid topline, correct tail set and angles. We are very excited about the future of this pretty boy and cannot wait to see how he grows! Tripp has started his show career off with a BANG! He went Reserve Winners to the MAJOR both days of his first weekend out! Tripp is currently MAJOR pointed from the Bred-By class at just 1 year old! He currently has 5 points towards his Championship with a BEST BRED BY EXHIBITOR IN SHOW! !